Celestis’s first lunar burial occurred on July 31, 1999. 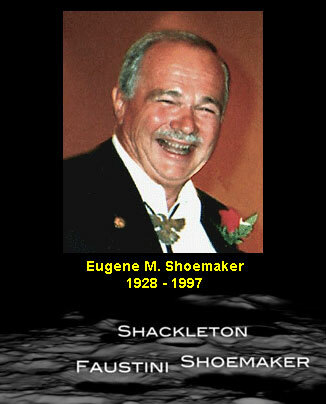 Celestis helped friends of noted planetary geologist Dr. Eugene Shoemaker include a symbolic portion of his remains on the NASA Lunar Prospector mission launched January 6, 1998. Three craters at the Moon’s south pole named after geographer Arnaldo Faustini, Antarctic explorer Ernest Shackleton and planetary scientist Eugene Shoemaker. Lunar Prospector was one of the most productive, least expensive space missions in history. 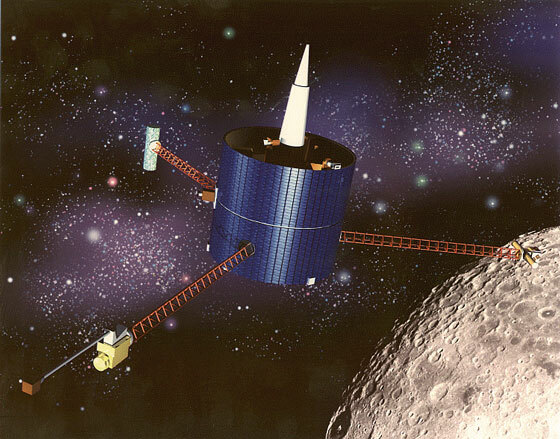 Part of NASA’s Discovery Program, Lunar Prospector served as a follow-on to the successful Clementine mission. In fact, Dr. Shoemaker served on the Clementine science team. In 1994, the Clementine spacecraft orbiting the Moon made observations that indicated the presence of water ice on the lunar surface. On March 5, 1998, it was announced that Lunar Prospector had also found evidence suggesting the presence of water ice at both lunar poles. The presence of water ice on the Moon would facilitate future attempts at lunar colonization. How fitting that, via the first lunar burial, Dr. Eugene Shoemaker participated in one last experiment — an experiment that could benefit our future in space. Learn more about the Celestis Luna Service. Celestis provided its first Luna Service mission by helping friends of noted planetary geologist Dr. Eugene M. Shoemaker include a symbolic portion of Dr. Shoemaker’s remains on the NASA Lunar Prospector mission launched January 6, 1998. 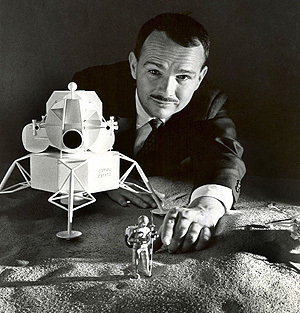 Dr. Eugene M. Shoemaker, a pioneer in the exploration of the Solar System, had longed to go to the Moon as an Apollo astronaut and study its geology firsthand. A medical condition diagnosed in the early 1960s prevented him from doing so. Dr. Shoemaker went on to help select and train Apollo astronauts in lunar geology and impact cratering. His achievements in these areas earned him the United States’ highest scientific honor, the National Medal of Science in 1992. He became world-renowned when he, his wife Carolyn, and astronomer David Levy discovered Comet Shoemaker-Levy 9, which impacted the planet Jupiter in July 1994. Lunar Prospector was one of the most productive, least expensive space missions. Part of NASA’s Discovery Program, Lunar Prospector served as a follow-on to the successful Clementine mission of 1994. In 1994, the Clementine spacecraft orbiting the Moon made observations that indicated the presence of water ice on the lunar surface. On March 5, 1998, it was announced that Lunar Prospector had also found evidence suggesting the presence of water ice at both lunar poles. Listen to an interview with Carolyn Shoemaker about how fitting her husband’s lunar burial was. The next Celestis Luna Service mission is projected to launch next year. History often accords to a selected individual the role of catalyst, the spark who creates a social, political, or economic paradigm shift. Surely Gerry O’Neill was such an individual. Dr. O’Neill was an accomplished experimental physicist, successful entrepreneur, pilot, inventor, astronaut candidate, devoted family member, and gifted professor who constantly challenged and inspired his students. Indeed, it was a class exercise — first year physics at Princeton University — which started Dr. O’Neill on a path that would ultimately lead him to establish the modern conceptual, theoretical, and technical foundation for the large-scale human colonization of space. During the course of this work he wrote several books, including the award-winning The High Frontier; served as an adviser to NASA and the Congress and as a member of the President’s National Commission on Space; and founded the Space Studies Institute (Princeton) to support the scientific research required to carry out his vision. Today, Gerry O’Neill’s legacy continues through his Space Studies Institute and through the lives of people around the world who were touched by his message — and who consequently are devoting their lives to the extension of humanity into space. Gerard K. O’Neill flew on the first Celestis Memorial Spaceflight, The Founders Flight. On July 14, 2015, NASA’s New Horizons spacecraft flew past Pluto, carrying a small amount of the ashes of American astronomer Clyde W. Tombaugh, along with the dreams of all who, like this Kansas farm boy, gazed toward the heavens in the name of exploration and discovery. New Horizons, the first mission to Pluto, provided the closest look ever at the ninth planet while completing the initial reconnaissance of the solar system. 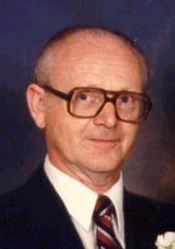 Klaus Karl Rheinhold Ernst Sachse’s passing went by with little notice by this world, save for a handful of family members and a small contingent from the tennis/curling club to which he belonged. Klaus Karl Rheinhold Ernst Sachse was not renowned for anything in particular, nor accomplished in some noteworthy endeavor. However, he did make a difference in the lives of his three children and three grandchildren; and as such, left a priceless legacy. 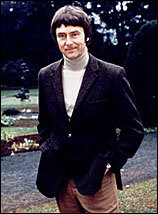 He was a rather stoic and extremely private man – rarely given to outbursts of emotion. He was also a proud man who tried to live his dream until the dream was all that was left to him. He held inside of himself a spark and a vision that he passed on to his children. In the grand cosmic scheme of things he was an ordinary man who dreamed of a greater life. And that life was to be lived among the stars! His later years were spent building models, puttering around in his garden, exploring culinary adventures; and of course, enjoying the company of his small circle of friends and family. Thanks to Celestis, we can now, a decade after his passing, honor his wish and fulfill his life-long dream by sending him to the stars that were always his real home. His spark is alive in those who remember and still love him. We still miss you very much, Dad. The June 21, 2013 launch from Spaceport America, New Mexico of the Celestis Centennial Flight — which was named in honor of the 100th anniversary of New Mexico’s statehood — marked the cumulative flight of over 1,000 Celestis flight capsules into space over the course of Celestis’ company history. – Viewing the thrilling launch! After the flight each family received their loved one’s flown space capsule — with the cremated remains still inside — as a keepsake. Families also received a video of the launch and related activities, as well as a Launch Certificate. – Maria Swan who was crowned “Miss World Argentina” in 1967 and became Argentina’s first female airline pilot. The mission flew aboard an UP Aerospace SpaceLoft XL launch vehicle, which has flown each of Celestis’ Earth Rise service missions. The spacecraft followed a trajectory like that flown by the astronauts on NASA’s early Gemini missions by flying into space and, after experiencing the zero gravity environment, returning to Earth. 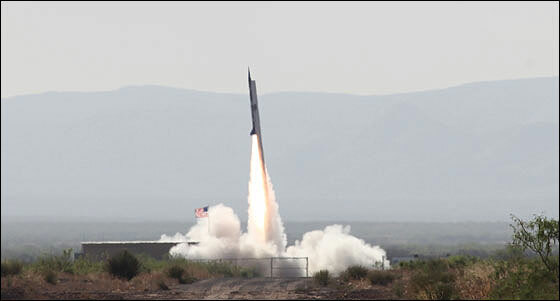 The Centennial Flight flew to an altitude of 73.9 miles (118.9 kilometers) and landed at White Sands Missile Range, New Mexico approximately 23 miles (37 kilometers) downrange. This was Celestis’ 5th Earth Rise mission and 12th overall memorial spaceflight. Starting at just $1,295, the Earth Rise Service is a popular memorial spaceflight choice which, unlike other options such as Earth Orbit and lunar memorial missions, returns the flown cremated remains to the family. Read more about the Celestis Earth Rise Service…. 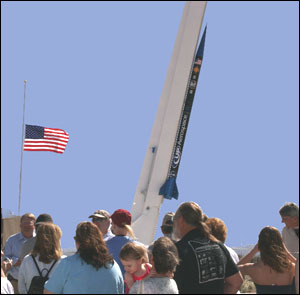 When Celestis launched its 10th memorial spaceflight from Spaceport America, New Mexico in May 2011 the company decided to name the mission “The Goddard Flight” in honor of Robert Goddard, a famous American space pioneer. 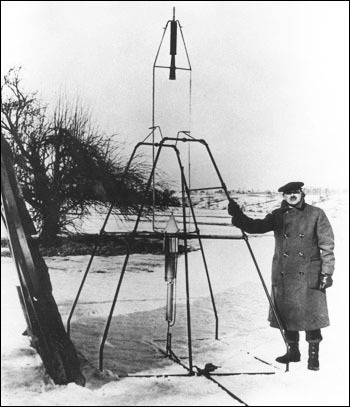 American rocketry pioneer Robert H. Goddard and his first liquid-fueled rocket, March 16, 1926. Robert Goddard, the father of modern rocket propulsion, spent a dozen years in New Mexico developing and testing his rocket designs. So when Celestis launched its 10th memorial spaceflight from Spaceport America, New Mexico in May 2011 the company decided to name the mission The Goddard Flight in honor of this famous American space pioneer. Celestis’ Spaceport America launches fly on a suborbital trajectory, like Alan Shepard’s historic May 1961 suborbital spaceflight when Shepard became the first American to fly in space. Like other Celestis Earth Rise service missions, the Goddard Flight flew into space, remained above Earth’s atmosphere for several minutes, and then returned to Earth. 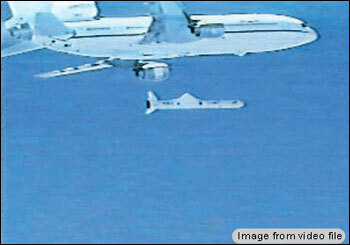 After the flight the Celestis payload was recovered, validated as having reached space, and each flown capsule – still containing its ashes – was returned to each family as a keepsake. Besides the launch and related activities at Spaceport America, Celestis publishes on its website the biographies of the people on board each of its memorial spaceflights. In addition to the flown capsule that is returned to each family, the flight’s online biographies provide a lasting tribute to the people whose dreams of spaceflight were fulfilled by their families through Celestis. With 14 memorial spaceflights to date, we have flown more people in space than all the world’s space agencies combined. But did you know that there have been two Celestis companies? In the 1980s a Melbourne, Florida company called “The Celestis Group” wanted to fly human ashes on board a launch vehicle provided by Space Services Inc. of America, which conducted the first private launch into space in 1982. Though ultimately unsuccessful in launching the company, by proving that people all over the world were interested in memorial spaceflights this pioneering effort laid the groundwork for today’s Celestis, Inc., which was formed in 1994 by two former employees of Space Services Inc. of America. Indeed, among the 24 people on board the first Celestis memorial spaceflight in 1997 were two of the three space entrepreneurs who formed the original company. Beauford Franklin was a mechanical engineer who worked for Lockheed and United Technologies on such projects as the U.S. Air Force Titan IIIC rocket program, the Navy Polaris missile program, and NASA’s space shuttle. James Kuhl served as a combat pilot in World War II, flying P-47 Thunderbolts and P-51 Mustangs in 100 missions over Europe. He would retire from the Air Force Reserve as a Lt. Colonel. Both gentlemen dipped into the future with their vision of memorial spaceflight, foreseeing a time when the heavens would thrive with commerce. So it was only flitting that they would be among the first of many aerospace professionals who have flown on Celestis missions. The experienced professionals at today’s Celestis stand ready to help you commemorate the life of a departed loved one, or prearrange a memorial spaceflight for yourself. Have you ever heard of a memorial being conducted at night? That’s what Celestis did when it launched the ashes of 320 mission participants into space May 22, 2012 from Cape Canaveral, Florida. Nighttime launches are spectacular events – especially when someone you loved is on board. 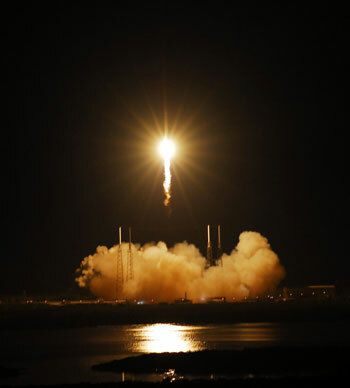 The Celestis families who witnessed the liftoff of The New Frontier Flight were overcome with joy as the launch vehicle carrying their loved ones’ ashes ascended into the night sky, like a star joining the heavens above. Among the people on Celestis’ New Frontier Flight were Star Trek actor James Doohan (“Mr. Scott”), musician Randy Van Warmer – known for his hit song, “Just When I Needed You Most” – and Mercury 7 astronaut L. Gordon Cooper. In May 1963 Cooper piloted the Faith 7 spacecraft on the Mercury 9 mission – the last of the Project Mercury missions. In August 1965 he commanded the Gemini 5 mission, where he and astronaut Charles Conrad set a new space endurance record at the time, orbiting Earth for approximately eight days. Yet the overwhelming majority of New Frontier Flight participants were everyday people from various walks of life. There were engineers, pilots, homemakers, a plumber, entrepreneurs, a delivery truck driver, educators, students, doctors, a police officer, and artists. They hailed from the United States, Canada, Germany, the United Kingdom, China, India, Taiwan, Japan, Australia, The Netherlands, France, South Africa and Russia. While they had different backgrounds, they had families and friends who wanted to commemorate their lives in a truly unique way that reflected their interests in space exploration, science fiction and the stars above.